By Andrea Kowalski-Rospierski M. Ed. 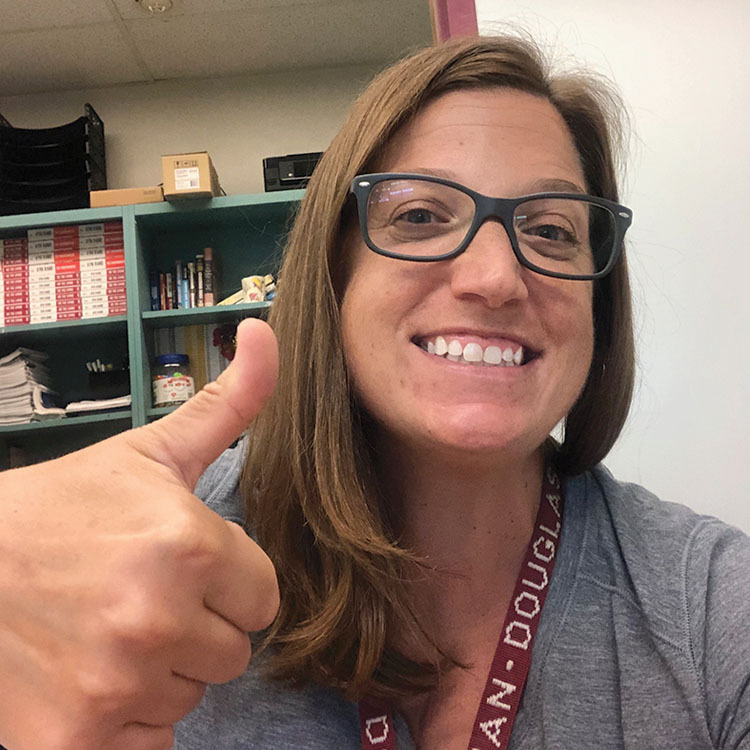 In her 11th year at MSD teaching English 2, AP Capstone Seminar, AP English Literature & Composition, Mrs. K-R is also Douglas high school’s Assistant Varsity Softball Coach. I’m not a big fan of the term the “new normal” or being told that I’m okay. Life is fraught with difficulties, and it’s easy to simply tell someone to move on. However, when terrible things happen, it can be pretty tricky to just keep going, regardless of how many breathing techniques I learn, essential oils I smell, or various ways to tap on my head. Moving on is a personal decision. I know that I will never forget what happened at my school, my second home, on February 14th of last year, but what I do know is that I have the strength, determination, and sheer grit to continue on with my new perspective. I have been able to find an inner drive and essentially am now on the path to getting my groove back (apologies for the cliché phrase). It is still difficult to get up when my alarm goes off, and I do have lapses where things seem arbitrary, but I will say that those moments are getting fewer and farther between. It’s as if my brain is rewiring itself; enabling me to press forward in my newly adapting life. I’m finding joy and passion being in my classroom and on campus again, much of which I owe to my students … Young people who have been through more than any human being should ever have to endure. This is my eleventh year teaching at Stoneman Douglas, and it is my fifth year coaching softball. I have taught and coached upwards of 2,000 teenagers in my career. These teenagers fuel my drive to be an educator. They make everything, and I mean everything, including but not limited to trainings, classes, paperwork, lesson planning, webinars (worst word ever! ), evaluations, county mandates, and staff meetings, worth it. Being a teacher is most definitely a unique career and not one that can simply be taken lightly or chosen on a whim. I am truly blessed and grateful to not only have found a career that I am passionate about, but to also be married to an educator who also teaches at Stoneman Douglas. We have been able to find strength in each other, which has allowed us to both continue moving forward. Ernie (Rospierski) and I have been through a lot in our lives. Aside from February 14th, we had a very difficult and truly testing pregnancy. One which, I almost didn’t make it through alive. Our son, also named Ernest, was born ten weeks early after I first went into labor at twenty-four weeks. The two of us have been faced, or rather kicked in the face, by difficulties. Trauma is a part of life that no one wants to go through, but nevertheless will inevitably face at some point. Even though I have come close to death a few times in my life, I am no expert on trauma. What I have learned is that trauma is something everyone deals with differently, and that it is important to find hope and strength wherever you can.